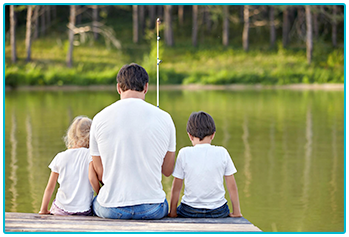 10 GREAT TIPS TO LURE YOUR FAMILY INTO FISHING! You might find that a fishing trip is the ideal way to escape the real world on your own and relax. Have you ever thought that it could also be the perfect family day out? 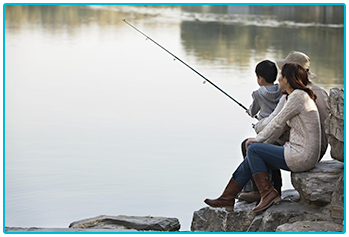 Taking the family along and casting a line together could lead to a magical time to bond and pick up a new passion! As with any family activities, there are certain things that you could do to make sure that you get the most out of your time and keep everyone happy! Here at The Insurance Emporium, we want to encourage you to enjoy your family time! That’s why we’ve put together this list of tips to make the most of your family angling adventures! You might be a passionate and avid angler but you should try and keep things fun by the water! Screaming at the kids for losing a potential catch is no fun for anyone! 2. Keep it short and snappy! 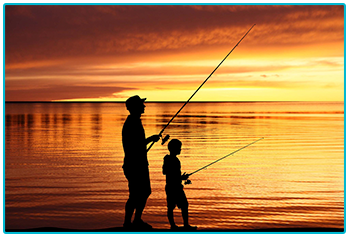 Spending a day with your rod in hand from sunrise to sunset might sound perfect to you but children have a habit of losing interest quickly! Casting a line for a couple of hours at a time might be the ideal start. Most parents don’t need to be told this but having children close to water can be dangerous, life jackets are be a good idea! Also, make sure only the adults are handling hooks, knives and sharp objects. Keep your eye on the little ones at all times! It’s pretty much guaranteed that your family will not enjoy a cold day sat in the pouring rain waiting for a bite. Making sure you pick a day with a good forecast before heading outdoors could be vital! Somewhere like the Kilnsey Park Estate in North Yorkshire could be the ideal place to take the family for a taste of the action. Their ‘Fun Fishing’ experience provides equipment, guidance and almost guarantees a catch! Nobody needs to deal with a hungry child… or a hungry mum and dad, for that matter! Packing a picnic could save you from those hunger pangs and add a little adventure to the day! You’re not looking to break any world records on a family fishing trip, so you can afford to keep your gear setup simple. A rod with an easy to use push-button reel should be ideal! It could be a good idea to get your kids excited about a fishing trip before you head out. Take time to teach them about fish, show them picture books and generally build up to the trip and you might find them getting giddy! If you find the going is tough and you’re not getting many bites, those kids will soon let you know how bored they are! Like many parents will know, having some distractions on hand such as colouring books, games or toys could save you from having to pack up early! You might be a passionate angler but try to remember that this is a family day out. Expecting the rest of your brood to immediately love it and be natural anglers is a recipe for disaster! Just enjoy sharing your passion with your loved ones! Sharing your passion with those closest to you can be a truly magical thing but it’s always important to set your expectations! Whether you’re taking your husband, wife or kids for the first time, just try and enjoy yourself in the fresh air! You might also want to consider some Fishing Insurance in case anything goes awry on your trip! At The Insurance Emporium, our new Fishing Insurance policies come with a 25% Introductory Discount* and include cover for Loss, Theft Or Accidental Damage up to £15,000^. Check out The Insurance Emporium today to find out more! * 25% Introductory Discount is available for the first 12 premium payments on lunar and calendar monthly policies or one premium payment on annual policies. ^Cover up to £15,000 available on Lunar Monthly Zander policies. This blog is in no way sponsored, endorsed or administered by, or associated with Kilnsey Park Estate.